Bill: Black can live by capturing , but that should be a last resort. This is properly a two stage ko. Black should normally play to win it with and . Bill: Suppose that Black takes the second leg of the ko ( ). Now if , Black has lived with sente. If White makes a ko threat and Black replies, now when White takes back, if Black is desperate he can take and live. So Black should almost always take the second leg in preference to taking . Also winning the two stage ko is closer to fifteen points better, because Black can intrude into White's territory on the left side. That's important. 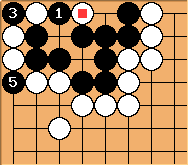 If White has , then is normally too small to play this as a two stage ko. seems natural after . Then what? The sequence I had in mind when I counted eight points was Black a - White b. Can Black do better? Shaydwyrm: For black to play , he must have ignored some ko threat. 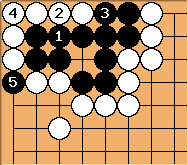 If white plays , followed by black a - white b, then black can respond to the ko threat and white has lost his two stones, plus 2 points of territory with no compensation. On the other hand, if white locally ignores to follow up on his ko threat, black can intrude on white's territory further. I think this is what Bill is talking about. If White does not play , then Black can jump to c. This problem, like most problems, does not show enough of the board to evaluate such a jump, but I estimate it as about a 7 point sente. Brent: Ah, I see now! Thanks!